. . . and babies make four. : Hello Kindergarten. Eric took the day off of work and made the girls heart-shaped waffles for breakfast. They spent the morning telling us that they couldn't believe it was their first day of Kindergarten and asking if it was time to get ready yet. "Mom, I just can't believe that today is my first day of Kindergarten! Mom, today I start Kindergarten! Mom, can we get dressed now?" We took them to school, walked them into their class and then stood around with all the other parents taking pictures and video. They were thrilled and excited to be there and had Cheshire-cat-like smiles plastered to their faces. I smiled a lot too -- until we got to the car and I burst into tears. They were still smiling when we picked them up. Their only complaint was that I wouldn't let them ride the bus home. Tonight we had a "Kindergarten Celebration"* complete with flowers, candles, a "Kindergarten" banner on the table and special crowns. The girls and I baked a chocolate cake topped with sugared apples -- "Mom, isn't it funny that apples are the logo for school?" -- and a school bus on the cake plate, which brought us back to a conversation about why I won't let them ride the bus. All in all it was a spectacular first day. * The idea for this dinner was borrowed from Stephanie and I wanted to make sure that she received credit for the fun idea. Michal and Kenna thought it was fabulous and so did I! 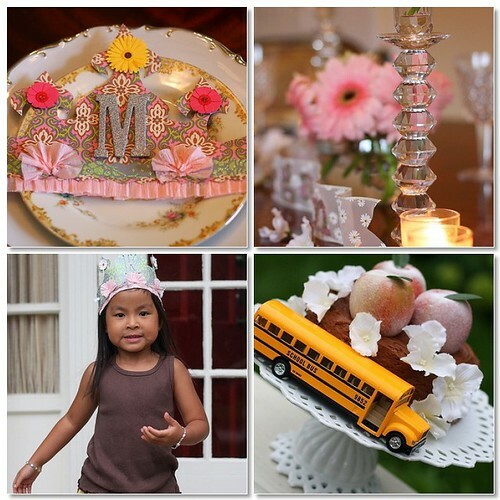 Ironically, the very first blog post of hers that I ever read was her back-to-school dinner for her girls last year. 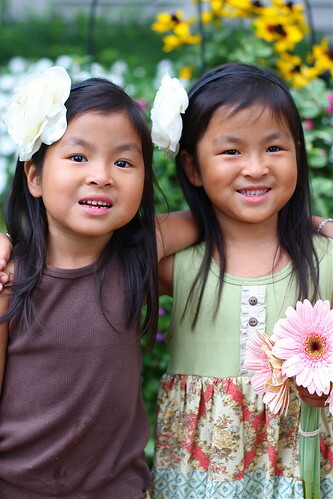 Such sweet and beautiful kindergarten girls! Am sure they will have an amazing year -- and so will you! I've been reading about these beauties since they came home, and was a little choked up reading this! 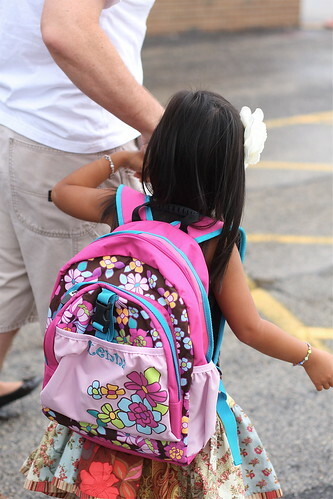 My little one starts tomorrow and is much more nervous than happy about Kindergarten! I think a crown is in order. What beautiful girls you have. LOVE their outfits (we have the same). I also love the idea of the celbration after the first day. I am thinking we may start doing that as well every year. Awww, SO sweet! Love those 1st-day-of-Kindergarten smiles! I just love the materials in the girls outfit too. Beautiful! Sigh, not looking forward to this. Congrats one your first day!! My little sprite starts kindergarten on September 9th and I hadn't even thought about having a special "First day" dinner, but you've inspired me and we might just do that! I do plan to take the day off from work so I can take her to school and do the whole photo thing! Glad the twins first day of kindergarten was such a big success. Oh my goodness, they are just so cute!!! They just had to have been the talk of the school on their first day! And what a fabulous little party you threw for their big day. How fun!! So glad the girls had a wonderful first day of school. They look adorable in their outfits! What a beautiful post. The girls look so happy and so confident. You have done very well these last 5 years to shape them into confident and independent young girls. Your dinner looks so elegant and fitting for Michal and Kenna. I adore the crowns..were they difficult to make? I am not crafty and I admire you talent in that department. Okay...those outfits!! Soooo cute, where did you get these?? Your pictures are amazing and that dinner setting is gorgeous-you are SOO talanted! So sweet and beautiful! I was just thinking about you guys this week and wondering if the girls were going to start school soon. Congratulations to the newest Kindergartners on the block. And huge hugs to mama. A crown is always in order!! The lunch lady idea is priceless! I love it. The crowns weren't hard at all and you could easily make one for Kate. 2. I then punched a hole on each side of the crown for the ribbon ties. 3. Next, I used crepe paper (the kind that comes in a roll and you use for parties), cut the strip in half and pleated it with my fingers. I tacked the pleats with glue stick and then attached it to the back with hot glue so just the ruffle would show in the front. 4. I pleated a different strip of crepe paper and made the little fans for the front. Again, I attached them with hot glue. 5. 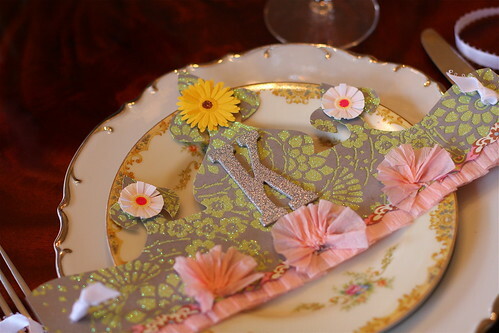 I then attached the little paper flowers, which came with little sticky dots already on them, and the glittered "K" and "M," using hot glue. 6. On Kenna's crown I layered some paper as well. 7. Finally, I tied a ribbon in a knot on each side. You could make it really simple and just cut out the crown, add a letter and a couple ribbons and be done. The most time-consuming part was pleating the crepe paper. I just like that vintagey look but you could skip that step entirely. Also, at scrapbook stores there are tons of embellishments that you can buy and just stick on. 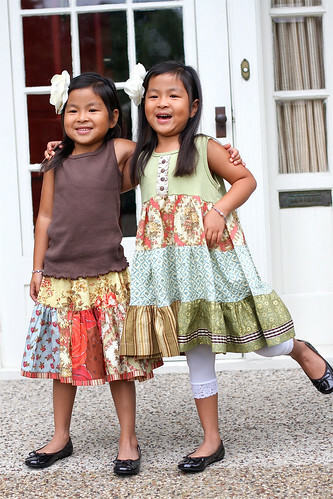 Their outfits are by Matilda Jane. www.matildajaneclothing.com. Thankyou for honouring NieNie. I hope more families have these confidence building celebrations. God bless the kids. Kristi, I swear we can get you help. They have Martha-Anonymous. I signed up and no longer feel compelled to make every single thing we eat from scratch. I am sure it could help you too. Ha ha. Seriously - though, hope the girls have a great time at school. Thanks Kristi! I will for sure check them out!! Wasn't it just the other day I began following your journey in China? I think you've packed a lot into their lives so far. I hope they will always enjoy school. Congratulations!!! Love the dinner celebration, what a great idea! You've given me some great ideas for next year, when Allison heads off to kindergarten. You really made it special for your girls, Kristi! What a wonderful mommy you are! 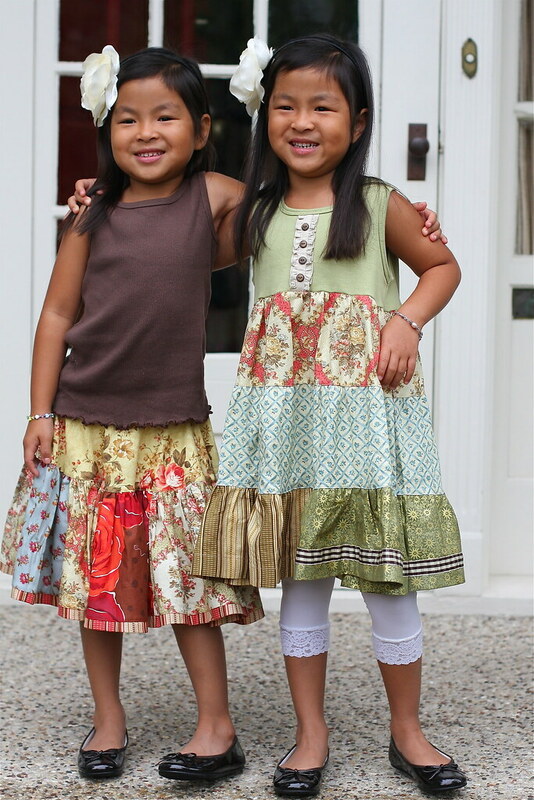 Congrats on your first day of Kindergarten girls. You will love it (and Mommy eventually will become accustomed to Kindergarten). Beautiful party! love it! they are so adorable. where did you get their backpacks? haven't seen one like it. Congratulations on moving into this next phase of your lives. I hope all goes well in kindergarten. Mikayla started this week and just LOVES it. We had special cupcakes for our celebration--I love the idea for the back to school celebrations! Adorable! I can't believe how big they are and have followed you guys since you went to China, never for a second thinking we would parents to twins as well! I think about that day for us, in a few years, and just know I will shed a few tears, even if our girls don't. I hope I can make it as special as you did. BTW, where did you find the white leggings? I have been searching for some for months! Congrats on kindergarten! 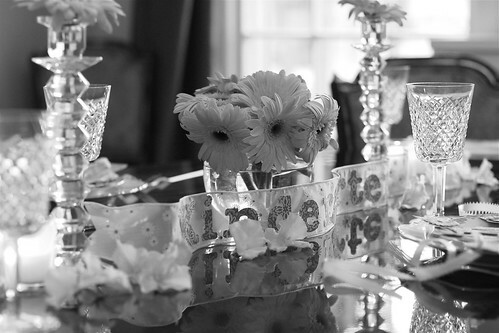 Love that tablescape and crowns. 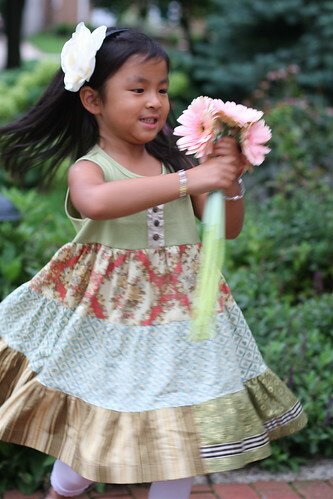 I absolutely adore the fabric you picked out for the skirt and dress. You are such a creative person!